High-purity Ar was selectively sepd. by pressure swingabsorption(PSA) method from the air. Sepg. process comprises (1) inject air into 1st absorption appratus (AA) contg. column(filling with 3 carbon molecules), (2) obtg. a high-purity oxygen and midpurity Ar by PSA from air, (3) inject a former Ar into 2nd AA contg. column(filling with 2 carbon molecules) continuously, (4) circulating of desorptive gas from 2nd AA into 1st inlet of AA. Absorption pressure is 0.3- 10kg/cm2G; Desorption pressure is below 760 Torr. 제1도 본 발명의 방법을 수행하는 데 이용되는 장치의 개략도. FIG. 1 a schematic diagram of an apparatus used to perform the method of the present invention. 제2도 : 제1도의 장치에 있어서 시퀀스 및 타임 사이클을 나타낸 도면. FIG. 2: a diagram showing the sequence and the cycle time in the first-degree unit. 제3도 : 본 발명의 방법을 수행하는 데 이용되는 다른 장치의 개략도. Third Degree: a schematic view of another apparatus used to carry out the method of the invention. 제4도-제7도 : 제3도의 장치에 있어서 시퀀스 및 타임 사이클을 나타낸 도면. Figure 4 - The toned: a diagram showing the sequence and time cycles according to the third degrees device. 본 발명은 압력-스윙-흡착(pressureswing-adsorption, 이하 PSA라 약칭함)법에 의해 공기중에서 고농도 아르곤을 분리시켜 이를 수득하는 방법에 관한 것이다. The invention pressure-relates to a method for obtaining it by separating the high concentration argon in by the suction (pressureswing-adsorption, hereinafter abbreviated as PSA hereinafter) method an air-swing. 아르곤은 통상적으로 저온공기분리장치에 의해 공기중에서 얻는다. Argon is generally obtained from air by low-temperature air separation plant. 이 경우, 조 아르곤은 액체 산소제조 장치 내의 주 정류탑에서 액체 공기를 정류시키고, 이때 생성된 고농도 아르곤이 함유되어 있는 산소 유분을 회수한 다음에, 이를 다시 정류시켜 얻는다. In this case, the crude argon is rectified and the liquid air in the main rectification column in the liquid oxygen producing apparatus, wherein a number of the oxygen fraction to contain the generated high concentration argon in the following, is obtained by rectifying them again. 또한 고순도 아르곤은 수소가스를 조 아르곤에 도입시키고, 이때 생성된 가스 혼합물을 산소를 제거하기 위한 팔라듐 등과 같은 촉매로 충전된 산소 제거장치에 통과시킨 다음, 산소가 제거된 가스를 다시 정류탑으로 통과시킴으로써 조 아르곤으로부터 얻는다. In addition, high purity argon and introducing hydrogen gas to the crude argon, at this time was passed through the resulting gas mixture to the catalyst an oxygen removing device filled with such as palladium to remove the oxygen and then again passed through the rectifier to the oxygen is removed, the gas by obtained from the crude argon. 아르곤은 화학적으로 불활성이며 더우기 다음 표 1에 나타난 바와 같이 산소와 물성이 매우 비슷하기 때문에, 아르곤과 산소를 분리시키기가 까다로우며, 정류를 하게되면 많은 수의 단이 필요하게 된다. 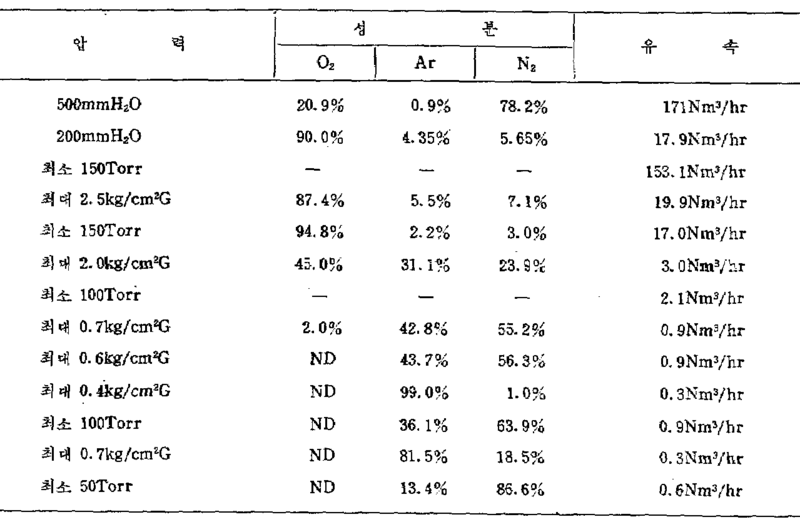 Argon is chemically inert Furthermore, because oxygen and physical properties very similar to as shown in Table 1, is tricky to separate argon and oxygen, it is necessary a large number of stages when the rectification. 흡착제를 사용하여 아르곤을 분리시키는 한 방법이 제안되었는데, 예를 들면 오스트레일리아 특허 제515,010호에는 아르곤, 산소 및 질소가스 혼합물을 산소와 질소에 대해 흡착도가 각기 다른 두 종류의 흡착제 A와 B로 충전된 탑으로 도입시킨 다음, 탑내에서 반복 PSA 조작을 하여 적어도 바라는 바의 순도를 지닌 아르곤을 수득하므로써, 아르곤, 산소 및 질소로 이루어진 가스 혼합물로부터 아르곤을 분리시키는 방법이 기술되어 있다. Using the adsorbent was a method is proposed for separating argon, for example Australian Patent No. 515 010 discloses a filling of argon, oxygen and nitrogen gas mixture to the adsorbent A and B adsorption degree of each of the two different kinds of for oxygen and nitrogen a a method of that introduced into the tower, and then to repeat the PSA in operation tapnae separation of argon from a gas mixture of argon, oxygen and nitrogen by give the argon having a purity of at least desired bar is described. 그런데 상기 방법에서는, 두 종류의 흡착제가 산소와 질소를 각각 흡착시킴으로써 아르곤의 농도가 증가하게 된다. However, in the method, thereby increasing the concentration of argon by two types of adsorbents is adsorbed oxygen and nitrogen, respectively. 이는 질소, 산소 및 아르곤에 대하여 흡착성이 각기 다른 두 흡착제를 사용, 공기 중의 질소와 산소를 연속적으로 흡착시킴으로써 아르곤을 분리시키는 방법이다. This is a method of separating argon by continuously adsorb nitrogen and oxygen in the adsorption property is used for each of two different adsorbents, the air with respect to nitrogen, oxygen and argon. 또한 상기 방법에 있어서는 두 종류의 다른 흡착제를 단일 흡착탑에 충전시키기 때문에, 각각의 흡착제에 대해 탑내부의 조건을 최적화하기가 까다롭게 되어 고순도 아르곤을 얻을 수 없게 된다. In addition, because it charges the two types of different adsorbents in the above method on a single adsorption tower, are picky is to optimize the conditions inside the column for each of the adsorbent can not be obtained with high purity argon. 더우기 컬럼 내부 조건을 흡착제 A 또는 B에 대해 최적화하면, 예를 들면 산소 흡착에 대해 최적화하면, 조건이 다른 흡착제에 대해서는 최적화되지 않기 때문에 산소는 흡착되지만 질소는 충분히 흡착되지 않는다. Moreover, when optimized for the adsorbent A or B inside the column conditions, for example, when optimized for the oxygen absorption, the oxygen adsorption conditions, but because they are not optimized for the other adsorbents is not enough nitrogen adsorption. 이 경우 수득한 아르곤에는 상당량의 질소가 함유하게 된다. In this case there is obtained argon containing a significant amount of nitrogen. 그러므로 만족할만한 조작은 수행할 수 없게 된다. Thus, satisfactory operation is impossible to perform. 또한 상기 오스트레일리아 특허에는, 수득한 아르곤의 어떤 특정한 순도를 언급하지는 않았으나, 이러한 방법에 있어 회수된 아르곤의 순도는 50% 이하이다. In addition, although not mention any specific purity, the said Australian patent, the obtained argon, in this way the purity of the argon recovery is higher than 50%. 이러한 점에 비추어, 본 발명자는 여러 종류 흡착제의 흡착 특성에 관한 광범위한 연구를 한 결과, 세공 직경의 가장 높은 분포가 3Å인 탄소 분자체와 세공 직경의 가장 높은 분포가 5Å인 제올라이트 분자체가 흡착 초기 단계에서 그 흡착 특성이 상이함을 발견하였다. In light of these points, the present inventors have extensive studies a result, the zeolite molecular adsorption its highest distribution with the highest distribution of 3Å a carbon molecular sieve with a pore diameter 5Å pore diameter of the adsorption characteristics of several types of adsorbent Initial its absorption characteristics in the stage was found to be different. 예를 들면, 탄소 분자체를 수분동안 흡착 조작시킬시, 그의 흡착-선택도가 감소하게 된다. For example, when the carbon molecular sieve to adsorb moisture during the operation, its absorption-selectivity is reduced. 특, 상기 탄소 분자체와 제올라이트 분자체를 하나의 동일한 흡착탑 또는 하나의 동일한 장치에 충전시키고 PSA 조작을 하였을때, 각각의 흡착특성을 충분히 이용할 수 없다. When charging the particular, the carbon molecular sieve and zeolite molecular sieve in a single adsorption column or the same one and the same apparatus and hayeoteul the PSA operation, can not fully take advantage of each of the adsorption characteristics. 상기 탄소 분자체는 장시간 흡착 특성을 지니고 있고 분자체가 질소와 산소를 동일한 부피로 흡착시키지만 흡착 초기 단계에서 산소가 질소보다 빠른 속도로 세공내로 확산되기 때문에, 이러한 산소와 질소간의 흡착 속도 차이를 이용하여, 즉 압력 동일화 사이클을 포함하는 1 내지 2분 이하 정도의 짧은 흡착 시간을 채택하여 분리 공정을 수행하는 탄소분자체를 사용하므로써 산소를 흡착시키는 것이 절대적으로 필요하다. The carbon molecular sieve has a long time, the adsorption properties and the molecular sieve is because diffusion into the pores at a higher speed than oxygen, the nitrogen in the adsorption initial stage but the adsorption of nitrogen and oxygen in the same volume, using the adsorption rate differences between these oxygen and nitrogen by, that it is absolutely necessary to use tansobun by itself to perform the separation step employs a 1 to 2 minutes or less short time of adsorption comprising a pressure equalization cycle, the oxygen absorption. 반면에, 상기 제올라이트 분자체는 질소를 선택적으로 흡착시키고 또한 질소 흡착력이 흡착시간에 무관하다는 특성을 지니고 있다. On the other hand, the zeolite molecular sieves and selectively adsorb nitrogen also has the characteristic that the nitrogen adsorption capacity is independent of the adsorption time. 본 발명에서는 하나의 동일한 흡착탑을 두 흡착제로 충전시키지 않고, 각 독립된 PSA 탑을 단지 한 종류의 흡착제로 충전시켜 각 흡착제에 대한 최적조건하에 단계적으로 질소와 산소를 분리시켜 아르곤을 수득하므로써 상기 두 흡착제 간의 특성 차이를 효과적으로 이용하였다. In the present invention, without filling the one and the same adsorption tower of the two adsorbent, it was only filled with one type of adsorbent each independent PSA column by stepwise separation of nitrogen and oxygen in the optimum conditions for each of the adsorbent of the two adsorbent By give the argon effectively it was used for characteristic differences between. 또한 본 발명에서는, 주성분인 산소와 적어도 3%의 아르곤으로 이루어진 출발가스를 탄소 분자체로 충전된 흡착 장치내에서 PSA 조작시켜 농축 아르곤과 고농도 산소를 동시에 수득함을 특징으로하여 PSA법에 의해 상기 출발 가스로부터 아르곤과 산소를 선택적으로 분리시키는 방법을 제공한다. In the present invention, by PSA operation a starting gas consisting of a main component of the oxygen and argon of at least 3% in an adsorber filled with carbon molecular sieve and characterized by obtaining a concentration of argon and the high concentration of oxygen at the same time, the by the PSA method providing from the starting gas a method of selectively separating argon and oxygen. 바람직하게는 공기를 제올라이트 분자체로 충전된 흡착 장치에 도입시킨 다음, 탄소 분자체로 충전된 흡착탑에 도입시키고, 이어서 이들의 각 흡착탑내에서 독립적으로 공기를 PSA 조작시켜 농축 아르곤과 고농도 산소를 동시에 수득함을 특징으로하여, 출발 가스인 공기로부터 PSA 법에 의해 고농도 아르곤을 분리시키는 방법을 제공한다. Preferably was introduced to the adsorbing device to charge the air with zeolite molecular sieves, and then was introduced into the adsorption tower filled with a carbon molecular sieve, then the concentration of argon and the high concentration oxygen simultaneously by independently operating the air PSA within their respective adsorption column characterized in that the obtained, and from the starting gas air provides a method for separating high concentration argon by the PSA method. 본 발명의 특징적인 구체예의 개요는 다음과 같다. Characteristic EMBODIMENTS Overview of the present invention is as follows. 제1단계 PSA 장치는 질소를 선택적으로 흡착시키는 기능을 지닌 제올라이트 분자체로 충전되어 있는데, 출발 물질인 공기를 여기에 공급하고 PSA 조작시켜 산소 94%, 질소 1% 및 아르곤 5%로 이루어진 가스를 수득한다. Step 1 PSA device may be filled with self-zeolite molecular having a function of selectively adsorbing nitrogen, the starting material, supplying air thereto and PSA operation by a gas composed of oxygen 94%, nitrogen: 1%, and argon 5% It was obtained. 제2단계 PSA장치는 산소를 선택적으로 흡착시키는 기능을 지닌 탄소 분자체로 충전되어 있는데, 제1단계 PSA 장치에서 수득한 가스를 여기에 공급하고 단시간 PSA 조작시켜, 산소를 흡착시키고 첫번째 아르곤으로서 아르곤을 약 40%(질소는 약8%)까지 농축시킨다. Claim there Step 2 PSA unit is filled with carbon molecular having a function of selectively adsorbing oxygen itself, claim to supply the gas obtained in step 1 PSA device into and manipulate short PSA, absorption of oxygen and a first argon argon to about 40% (nitrogen is from about 8%) and concentrated to. 상기 단계에서는, 산소 농도가 공급가스보다 높은(산소 농도 약 97%) 산소가스가 탈착 가스로서 수득되며, 또한 상기의 두 단계는 출발 가스의 산소 농도를 증가시키는 데 기여한다. In the above steps, and the oxygen concentration is higher than the feed gas (97% oxygen), oxygen gas is obtained as a desorption gas, and also contribute to the two steps of the above is to increase the oxygen concentration in the starting gas. 이는 독립된 PSA 장치내에 각흡착제를 충전시키고 각 장치를 상이한 독립적인 PSA 조작시키는 효과인데, 상기 두 흡착제를 하나의 동일한 장치에 함께 충전시키고 출발가스를 장치내에서 PSA 조작될 상기 두 흡착제로 도입시킬 시는 이러한 결과를 얻을 수 없다. This charging of each adsorbent in a separate PSA system and inde effect of different independent PSA operate such apparatus, during to the charge the two adsorbent with one and the same device and introducing the starting gas to the two adsorbents to be PSA operations in the apparatus You can not get these results. 또한 제3단계 PSA 장치는 동일한 탄소 분자체로 충전되어 있는데, 이 장치내에서 첫번째 아르곤을 제2단계 PSA 장치에서와 동일한 방법으로 PSA 조작시켜 산소를 흡착 제거하고 두번째 아르곤으로서 아르곤을 85%까지 농축시킨다. In addition, the step 3 PSA device may be filled with the same carbon molecular sieves, followed by PSA operation the first argon within the device in the same way as in Step 2 PSA unit was concentrated to remove adsorbed oxygen and argon as a second argon by 85% thereby. 이러한 제3단계에서, 질소 또한 아르곤에 대한 거의 동일한 조성비로 농축된다(8 : 40). In this third step, the nitrogen concentration is also at approximately the same composition ratio of the argon (8: 40). 질소에 대한 아르곤의 비는 변하지 않기 때문에 질소 함량을 더욱 감소시키기 위해서는 다른 정제 방법이 필요하게 된다. Because they do not change the ratio of argon to nitrogen in order to further reduce the nitrogen content is a need for other purification methods. 2단계 PSA 조작에 의해서, 산소 농도는 수 %까지 감소되지만, 산소를 완전히 분리시키기 위해서는 산소 1 몰당 2몰의 수소를 두번째 아르곤 가스에 가해야 한다. Step 2 by PSA operation, but reduced to the oxygen content of a few percent, in order to fully remove the oxygen shall be applied in a hydrogen oxygen per mole of 2 moles of the second argon gas. 다음에는, 수소가 가해진 두번째 아르곤 가스를 팔라듐으로 지지된 탈탄소 촉매로 처리하여 산소를 물의 형태로 분리시킨다. Next, the separation of oxygen in the form of water by treatment with a support for the second argon gas is applied to the hydrogen degassing palladium carbon catalyst. 상기의 제2단계 PSA 장치는 탑이 적어도 2개일 다탑형 장치일 수 있다. Step 2 of the PSA apparatus may be a top, at least two days the column-type apparatus. 그렇지만 탑이 4개 이상인 장치일 경우, 아르곤 수율은 장치 설비 코스트의 증가에 비례하여 증가하지 않으며, 탑이 2개인 장치인 경우에는 아르곤수율이 감소한다. However, when the top device is more than four, argon yield is not increased in proportion to an increase in the device cost equipment, and has reduced the argon yield when the top two individual devices. 그러므로 탑이 3개인 장치가 가장 유리하다. Therefore, the top three individual devices is most advantageous. 다음의 제1도에는 탑이 3개인 제2단계 PSA 장치에 대한 플로우 차트가 나타나 있으며, 제2도에는 조작 시퀀스가 나타나 있다. Following a first diagram of the tower has a flow chart for the third individual Step 2 PSA apparatus shown, FIG. 2, there is shown the operation sequence. 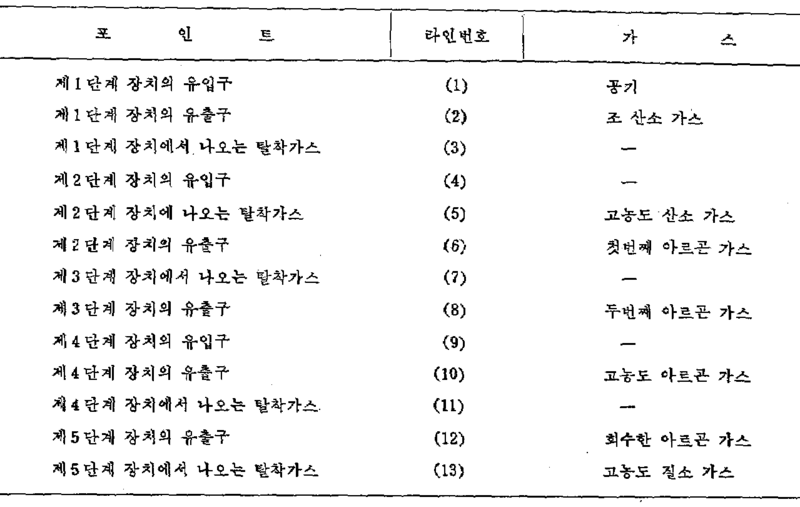 제1도에 있어서, 흡착탑 Ⅰ, Ⅱ 및 Ⅲ은 세공이 3Å인 탄소 분자체로 충전되어 있다. In FIG. 1, the adsorption tower Ⅰ, Ⅱ and Ⅲ is filled with a carbon molecular sieve 3Å pores. 조 산소(산소 94.5% ; 아르곤 4.5% ; 및 질소 1%, 3㎏/㎠)는 압축기 A'를 통해 탑 Ⅰ로 도입시키며, 여기서 산소가 흡착된다. Crude oxygen (oxygen 94.5%; 4.5% argon; nitrogen and 1%, 3㎏ / ㎠) sikimyeo Ⅰ it introduced into the tower through the compressor A ', where the oxygen is adsorbed. 이때 형성된 가스는 첫번째 아르곤 탱크 C'에 저장한다. The formed gas is stored in the first argon tank C '. 그리고 흡착된 산소를 탈착시켜 진공펌프 B'를 통해 고순도 산소 탱크 D'에 저장한다. And to desorb the adsorbed oxygen is stored in the "high purity oxygen tank D via the" vacuum pump B. 이러한 절차는 제2도에 나타난 바와 같이 연속적인 개방 및 차단 밸브로 수행한다. These procedures were carried out in a continuous opening and the shut-off valve as shown in FIG. 2. 제3단계 PSA 장치에는 탑이 2개 있으며, PSA 조작은 흡착 압력 동일화, 탈착, 압력동일화 및 출발가스에 의한 가압등의 연속적인 5단계로 수행한다. And the tower 2, Steps PSA unit 3, PSA operation is performed in five consecutive steps, such as pressure by the suction pressure equalization, desorption and pressure equalization, and the starting gas. 한편 제3단계 PSA 장치에서 나온 탈착 가스는 제2단계 PSA 장치의 공급 가스로 재순환시켜 아르곤을 회수한다. In the third step desorption gas from the PSA system it is recycled to the feed gas to the argon recovery of the step 2 PSA unit. 제3단계 PSA 장치에서의 조작을 끝마친 다음, 산소는 상술한 바와 동일한 방법으로 수소를 가하여 분리시킨다. The finished the operation in the step 3, and then the PSA system, oxygen is added to separate the hydrogen in the same manner as described above. 필요로 하는 아르곤의 순도가 99% 이상일 때는, 제3단계 PSA 장치의 생성 가스를 제올라이트 분자체로 충전된 제4단계 PSA 장치로 보내어 질소로 흡착, 분리시킨다. When the purity of 99% or more argon in need, thereby sending the separated adsorption of nitrogen, in a first step 4 PSA apparatus packed with zeolite minutes the product gas of step PSA unit 3 itself. 또한 제4단계 PSA 장치에서 나온 탈착가스를 제올라이트 분자체로 충전되어 있는 제5단계 PSA 장치로 보내어 질소를 흡착시키고 아르곤을 회수한 다음, 회수한 아르곤을 제4단계 PSA 장치의 공급 가스로 재순환시키는 방법도 가능하다. In addition, the for sending adsorbing nitrogen desorption gas from the four step PSA unit to a fifth step PSA system, which is zeolite molecular filled with itself and recycling the recovered argon then recovered argon in the feed gas of a PSA apparatus according to Step 4 method is also possible. 제5단계 PSA 장치에서 나온 탈착가스는 질소(주성분)와 아르곤으로 이루어져 있는데, 불활성 가스로서 이용된다. Fifth desorbed gas from the PSA stage device may consist of argon and nitrogen (main component) is used as the inert gas. 또한, 상기 제5단계 PSA 장치 대신에 저온 공기 분리 장치를 사용하여 고순도 아르곤을 얻는 것도 가능하다. It is also possible to use a low-temperature air separation plant to the place of the fifth step PSA unit to obtain a high-purity argon. 출발 가스로서 공기를 사용하여, 제1단계 PSA 장치에서 조 산소를 얻는다. And as a starting gas with air to obtain a crude oxygen in the first step 1 PSA unit. 그리고 제2단계 PSA 장치에서는 산소 농도가 95% 이상인 산소 생성물 및 첫번째 아르곤 가스를 얻는다. And the step 2 to obtain a PSA apparatus, the first oxygen product and an argon gas having an oxygen concentration of at least 95%. 이 첫번째 아르곤 가스를 제3단계 PSA 장치에서 농축시켜 소량의 산소가 함유된 두번째 아르곤가스를 얻는다. The concentration of the argon gas in the first PSA system the third step to obtain a second argon gas and a small amount of oxygen contained. 제3단계 PSA 장치에서 나온 탈착가스는 제2단계 PSA 장치의 공급가스로 재순환시킨다. Step desorbed gas from the PSA unit 3 is recycled as a feed gas for the first step 2 PSA unit. 그리고 두번째 아르곤 가스내의 소량의 산소 분리 장치내에서 수소 환원에 의해 분리시킨다. And it is separated by the hydrogen reduction in the amount of the oxygen separation device in the second argon gas. 산소가 존재하지 않은 아르곤은 제4단계 PSA 장치에서 처리하여 질소를 흡착, 분리시킴으로써 적어도 99% 농도의 고순도 아르곤을 얻는다. Argon, oxygen that is present is to obtain a high-purity argon concentration of at least 99%, by adsorption, to remove the nitrogen from the PSA system and processing the fourth step. 제4단계에서 나온 탈착 가스는 제5단계 PSA 장치로 도입시켜 아르곤을 회수하는데, 이 회수된 아르곤은 재순환시켜 제4단계 PSA 장치의 공급 가스와 혼합시킨다. The desorption gas from step 4 is to recover the argon is introduced in a fifth step the PSA system, the recovered argon was recirculated is mixed with the feed gas of a PSA apparatus according to Step 4. 제5단계 PSA 장치에서 나온 탈착 가스는 질소가 풍부한데 이를 불활성 가스로 사용한다. The desorbed gas from step 5, the PSA system uses this as an inert gas used is nitrogen rich. 고순도 아르곤의 전 수율은 99% 이상의 순도로 조 산소 생성물 내 아르곤을 기준으로 하여 40% 이상이다. Of high purity argon before yield is 40% on the basis of argon to oxygen of at least 99% pure crude product. 출발 가스로서, 아르곤 4.5%가 함유된 조 산소를 아르곤 약 12%가 함유된 가스 혼합물(저온 공기 분리 장치의 정류탑에서 나오는 것)로 대치시키면, 제2단계 PSA 장치 및 마지막 단계 PSA 장치의 조작을 더욱 효과적으로 수행할 수 있다. As the starting gas, if replaced by (the coming out of the rectification column of a cryogenic air separation unit), a tank containing oxygen is argon, 4.5% argon, about 12% contained a gas mixture and the second stage PSA unit and operation of the last stage PSA unit the can be done more effectively. 이러한 방법 또한 본 발명의 영역에 포함된다. These methods are also within the scope of the invention. 본 발명에서 사용한 제올라이트 분자체는 그 세공 직경의 분포가 5Å에서 가장높은 것이 바람직하며, 또한 본 발명에서 사용한 탄소 분자체는 그 세경 직경의 분포가 3Å에서 가장 높게 나타나는 것이 바람직하다. Zeolite molecular sieve used in this invention is that the distribution of the pore diameter is most preferably from 5Å, also carbon molecular sieve used in this invention preferably have a diameter distribution of the small-diameter appears highest in 3Å. 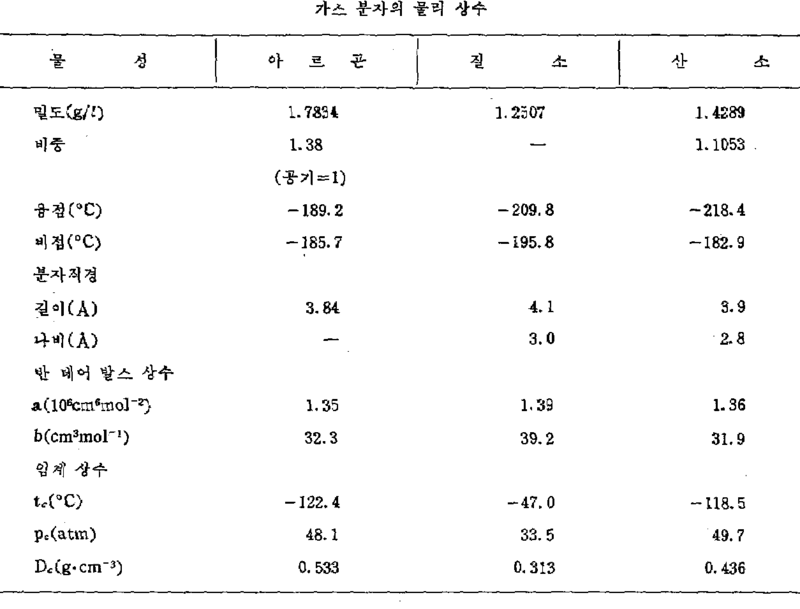 한편 흡착 압력은 경제적인 면에서 볼 때, 0.3-10㎏/㎠G 범위내가 바람직하며, 1-3㎏/㎠G 범위내가 더욱 바람직하다. The adsorption pressure is as viewed from the economic aspects, 0.3-10㎏ / ㎠G range, preferably I, 1-3㎏ / ㎠G range I are more preferred. 그리고 탈착 압력면에서 볼 때는 탈착 압력이 낮게되면 효율이 더욱 좋아지게 된다. And this becomes even better efficiency when the desorption pressure low when viewed in the desorption pressure side. 통상적으로 탈착은 400Torr 이하의 압력으로 수행하는데, 200Torr 이하가 바람직하다. Typically desorption is carried out to a pressure of 400Torr or less, the 200Torr or less. 이론적으로 효율은 흡착 용량면에서 볼 때, 저온에서 흡착을 수행하고 고온에서 탈착을 수행할 때 높아지게 된다. Theoretically, the efficiency is higher when performing the suction from the low-temperature time in terms of adsorption capacity and performs desorption at high temperature. 그렇지만, PSA 조작은 단열적으로 수행되고 : 흡착열(발열)은 탈착열(흡열)로서 소모되기 때문에, PSA 조작은 실온에서 수행함이 효과적이다. However, PSA operation is carried out adiabatically: adsorption heat (exothermic) is consumed because a desorption column (endothermic), PSA operation is effectively performed at room temperature. 본 발명에 있어서. According to the present invention. 고순도 아르곤은 농도가 적어도 98%인 아르곤을 의미한다. High purity argon refers to the argon concentration of at least 98%. 본 발명에 있어서는, JIS에 의해 지정된 용접 아르곤과 같은 적어도 농도가 99.9%인 고순도 아르곤을 수득할 수 있지만, 이러한 고순도 아르곤의 수율은 낮다. In the present invention, but it is possible to obtain at least a high-purity argon concentration of 99.9%, such as argon welding specified by the JIS, the yield of such a high purity argon is low. 강철 제조에 있어서의 가스 배출 등과 같은 전용면에 있어, 농도가 약 98%인 아르곤으로 충분하기 때문에 본 발명의 방법은 이러한 응용면에, 특히 경제적인 관점에서 볼 때 효과적이다. In only the same side as the gas outlet of the steel production method of the present invention because the concentration is sufficient to be about 98% argon is effective especially when viewed from an economic point of view, this application surface. 본 발명에 있어서는, 각각 제2단계 PSA 장치와 제3단계 PSA 장치는 하나의 흡착탑으로 구성될 수 있지만, 통상적으로 각 단계의 PSA 장치는 다수의 흡착탑으로 구성되고, 흡착의 연속조작, 압력 동일화, 탈착, 압력 동일화, 및 출발 가스(또는 생성 가스)에 의한 가압을 연속적인 개방 및 차단 밸브로 수행함이 바람직하다. In the present invention, each of the step 2 PSA unit and the third stage PSA apparatus may be of a single adsorption column, typically the PSA system in each step is composed of a plurality of adsorption towers, the continuous operation of the suction and pressure equalization, desorption, it is preferred carrying out the pressure by pressure equalization, and the starting gas (or product gas) in a continuous opening and the shut-off valve. PSA 조작에 있어서 생성 가스의 조성과 수율간에는 상호 관계가 존재한다. A correlation exists between the composition and yield of the product gas in the PSA operation. 생성 가스의 순도가 증가하면 수율이 떨어지기 때문에 흡착 압력 및 순환시간 등과 같은 조작 조건을 목적 생성물의 순도에 준하여 선택해야 한다. An increase in the purity of the product gas must be selected according to operation conditions such as the adsorption pressure and the cycle time, since the yield to fall to the purity of the desired product. 다음의 실시예는 본 발명을 더욱 자세히 설명할 뿐이며, 본 발명이 실시예에 국한되는 것은 아니다. The following examples is only to explain in more detail the present invention, but the invention is not limited to the embodiments. 아르곤 4.5%, 산소 93.6% 및 질소 1.9%로 이루어진 혼합 가스를 각각의 크기가 40㎜D×500㎜H이며, 각각의 세공 직경이 3Å인 탄소 분자체 흡착제로 충전되어 있는 3개의 흡착탑으로 구성된 PSA 장치(참조 : 제1도) 중 첫번째 장치에 공급하고, PSA 조작을 수행한다. 4.5% argon, 93.6% oxygen and a mixed gas consisting of nitrogen is 1.9% 40㎜D × 500㎜H each size, PSA consisting of three adsorption columns, each of the pore diameter is filled with a carbon molecular sieve adsorbent 3Å device: supplying a first unit of the (see FIG. 1), and perform the PSA operation. 최대 흡착 압력은 2.0㎏/㎠G로 하고 탈착 압력은 150Torr로 한다. Up to the adsorption pressure is in 2.0㎏ / ㎠G and desorption pressure is a 150Torr. 제2도에 나타난 바와 같이 순환 시간은 흡착에 대해 38.5초, 탈착에 대해 38.5초, 및 압력 동일화에 대해서는 1.5초로 한다(1회 순환시 전체시간 : 120초). The circulation time, as shown in Figure 2 is 38.5 seconds for adsorption, 38.5 seconds for the desorption, and 1.5 seconds for the pressure equalization (one whole in the circulation time: 120 seconds). 생성물을 분당 0.8N1의 속도로 인출할시 아르곤 생성물은 아르곤 33.0%, 산소 52.3% 및 질소 14.7%로 이루어져 있다. When to withdraw the product at a rate per minute of 0.8N1 argon product consists of 33.0% argon, 52.3% oxygen and 14.7% nitrogen. 아르곤의 수율은 69%이고, 탈착 가스(산소 생성물)은 아르곤 1.5%, 산소 97.9% 및 질소 0.5%로 이루어져 있다. And the argon yield of 69%, the desorption gas (oxygen product) is made up of 1.5% argon, 97.9% oxygen and 0.5% nitrogen. 산소의 수율은 94.7%이다. The yield of oxygen is 94.7%. 실시예 1에서 얻은 생성 가스와 조성이 동일한 출발 가스를 탄소 분자체로 충전된 두번째 PSA 장치에 도입시킨다. Embodiment, to introduce the product gas with a composition of the same from the gas obtained in Example 1 in the second PSA system filled with a carbon molecular sieve. PSA 장치는 각각의 크기가 40㎜D×500㎜H이며 탄소 분자체로 충전된 흡착탑이 2개 있다. PSA system is the size of each 40㎜D × 500㎜H there are two of the adsorption tower filled with a carbon molecular sieve. 출발 가스는 아르곤 35.5%, 산소 50% 및 질소 14.5%로 이루어져 있다. The starting gas is made up of 35.5% argon, 50% oxygen and 14.5% nitrogen. 그리고 최대 흡착 압력은 1.0㎏/㎝G이고 탈착 압력은 100Torr이다. And a maximum adsorption pressure 1.0㎏ / ㎝G and desorption pressure is 100Torr. 순환 시간은 흡착이 45초, 탈착이 48.5초, 압력 동일화가 1.5초 및 출발 가스에 의한 가압이 3.5초이다 (1회 순환시 전 시간은 100초). Cycle time is the adsorption of 45 seconds, the desorption is 48.5 seconds, and the pressure equalization the pressure is 3.5 seconds of 1.5 seconds, and the starting gas (before the time when one cycle is 100 seconds). 생성물을 분당 1.0N1의 속도로 인출할시의 조성은 아트곤 71.1%, 산소 2.67% 및 질소 26.2%이다. The composition at the time to withdraw the product at a rate per minute is 1.0N1 art balers is 71.1%, 2.67% oxygen and 26.2% nitrogen. 아르곤의 수율은 53%이며, 탈착 가스는 아르곤 22.7%, 산소 66.7% 및 질소 10.6%로 이루어져 있다. And the argon yield of 53%, the desorption gas is made up of 22.7% argon, 66.7% oxygen and 10.6% nitrogen. 실시예 2에서 PSA 조작에 의해 얻은 탈착 가스를 실시예 1의 탄소 분자체로 충전된 첫번째 PSA 장치의 출발 가스 내로 재순환시킨다. Example 2 carried thereby into the recirculation of gas from the first PSA unit to charge the desorbed gas obtained by the carbon molecular sieve of Example 1 carried by the PSA in operation. 실시예 1의 탄소 분자체로 충전된 첫번째 PSA 장치는 흡착탑이 3개이며, 실시예 2의 탄소 분자체로 충전된 두번째 PSA 장치는 흡착탑이 2개이다. Examples carbon minutes the first PSA unit filled with a self-1 is the three adsorption columns, the second PSA system filled with carbon molecular sieve of Example 2, the adsorption tower is two. 최대 흡착 압력은 2㎏/㎠G이다. Maximum adsorption pressure is 2㎏ / ㎠G. 탄소 분자체로 충전된 첫번째 흡착 장치의 탈착 압력은 150Torr이고 탄소 분자체로 충전된 두번째 흡착 장치의 탈착 압력은 100Torr이다. Desorption pressure of the first adsorption unit packed with carbon molecular sieve is 150Torr and desorption pressure of the second adsorption unit packed with carbon molecular sieve is 100Torr. 출발 가스는 제올라이트 분자체로 충전된 PSA 장치에서 나오는, 아르곤 4.35%, 산소 93.5% 및 질소 2.15%로 이루어진 생성 가스이다. The starting gas is a product gas comprising zeolite minutes from the charging of the PSA system itself, 4.35% argon, 93.5% oxygen and 2.15% nitrogen. 탄소 분자체로 충전된 두번째 PSA 장치에서 나오는 생성 가스는 아르곤 71.8%, 산소 2.5% 및 질소 25.6%로 이루어져 있다. Generated gas from the second PSA system filled with carbon molecular sieve is made up of 71.8% argon, 2.5% oxygen and 25.6% nitrogen. 아르곤의 수율은 56%이다. The argon yield is 56%. 탄소 분자체로 충전된 첫번째 PSA 장치에서 나오는 탈착 가스(산소 생성물)는 아르곤 2.0%, 산소 96.6% 및 질소 1.3%로 이루어져 있으며, 산소의 수율은 99.9%이다. Desorption gas coming out from the first PSA unit filled with carbon molecular sieve (oxygen product) is made up of 2.0% argon, 96.6% oxygen and 1.3% nitrogen, and the yield of oxygen is 99.9%. 실시예 3의 탄소 분자체로 충전된 두번째 PSA 장치에서 나온 생성 가스를 산소 분리 장치에서 탈산소 시키고, 제올라이트 분자체로 충전된 첫번째 PSA 장치에서 PSA 조작시켜 질소를 제거하고 아르곤을 수득한다. Example 3 of the carbon molecular deoxidizing the product gas from the second PSA system filled with itself in an oxygen separation device, and, by PSA operation in the first PSA unit filled with a zeolite molecular sieve to remove the nitrogen and argon to yield the. 제올라이트 분자체로 충전된 첫번째 PSA 장치에서 나온 탈착가스는 제올라이트 분자체로 충전된 두번째 PSA 장치에서 PSA 조작시켜 질소를 다시 제거하고 아르곤을 회수한다. Desorption gas from the first PSA unit filled with zeolite molecular sieve is by PSA operation in the second PSA system filled with zeolite molecular sieve again to remove the nitrogen and argon recovery. 제올라이트 분자체로 충전된 두번째 PSA 장치에서 나온 탈착 가스는 제올라이트 분자체로 충전된 PSA 장치의 공급라인으로 재순환시킨다. Desorption gas from the second PSA system filled with zeolite molecular sieve is recycled to the feed line of a PSA apparatus packed with zeolite molecular sieve. 제올라이트 분자체로 충전된 첫번째 PSA 장치와 제올라이트 분자체로 충전된 두번째 PSA 장치는 각각 3개의 흡착탑으로 구성되어 있다. A second zeolite molecular PSA unit filled with the first PSA unit with a zeolite molecular sieve charge in itself is composed of three adsorption columns, respectively. 탈착 단계는 생성 가스에 의한 가압 다음에 진행된다. The desorption step proceeds, and then the pressure by the generated gas. 즉, 흡착탑을 생성 가스로 충전시키는 단계 다음에 진행된다. That is, the flow proceeds to the next step of the adsorption column filled with the product gas. 첫번째 PSA 장치와 두번째 PSA 장치에 대해 순환시간은 동일하며, 흡착에 대해서는 60초, 탈착에 대해서는 50초, 압력 동일화에 대해서는 10초 및 생성 가스에 의한 압력 회복에 대해서는 50초 이다. The cycle time for the first PSA unit and the second PSA system is the same and is about 60 seconds for adsorption, pressure recovery by 10 seconds, and the product gas for 50 seconds, the pressure equalization for the desorption 50 seconds. 제올라이트 분자체로 충전된 첫번째 PSA 장치의 흡착 압력은 0.5㎏/㎠G이고 탈착 압력은 50Torr이다. Suction pressure of the first PSA unit filled with zeolite molecular sieve is 0.5㎏ / ㎠G and desorption pressure is 50Torr. 제올라이트 분자체로 충전된 첫번째 PSA 장치 유입 가스의 혼합물 및 제올라이트 분자체로 충전된 두번째 PSA 장치에서 나오는 생성 가스(재순환 가스)는 아르곤 78.1% 그리고 질소 21.9%로 이루어져 있다. The first PSA unit zeolite molecular sieve and zeolite mixture flows generated gas from the second PSA system (the recycle gas) filled in the gas charge in itself is made up of 78.1% argon and 21.9% nitrogen. 생성 아르곤의 순도는 99%이며, 제올라이트 분자체로 충전된 첫번째 PSA 장치의 아르곤 수율은 55%이고 제올라이트 분자체로 충전된 첫번째 PSA 장치와 탄소 분자체로 충전된 두번째 PSA 장치를 결합할시 수득한 아르곤 수율은 79.8%이다. The purity of the product argon is 99%, and zeolite molecular argon yield of the first PSA unit filled with itself is 55% and the obtained upon combining the second PSA unit filled with zeolite molecular the first PSA unit and the carbon molecular sieve filled with a self- argon yield is 79.8%. 제올라이트 분자체로 충전된 두번째 PSA 장치에서 나오는 탈착가스는 아르곤 36.4% 및 질소 63.6%로 이루어져 있다. Desorption gas coming out from the second PSA system filled with zeolite molecular sieve is made up of 36.4% argon and 63.6% nitrogen. 그리고 제올라이트 분자체로 충전된 두번째 PSA 장치의 흡착 압력은 1.2㎏/㎠G이며 탈착 압력은 50Torr이다. And a suction pressure of the second PSA unit filled with zeolite molecular sieve is 1.2㎏ / ㎠G and desorption pressure is 50Torr. 제1단계-제5단계 PSA 장치는 제3도에 나타단 바와 같이 연결되어 있다. Step 1 - Step 5 The PSA unit is connected, as shown only in FIG. 3. PSA 조작은 제4도-제7도에 나타단 바와 같이 실시예 1-4의 것과는 다른 시퀀스 (sequence) 및 타임 사이클(time cycle)을 채택하여 수행하므로써, 공기로부터 고농도 아르곤을 연속적으로 수득한다. PSA operation is the fourth degree - By performing by adopting claim 7 Example 1-4 than other sequences (sequence) and cycle time (cycle time), as shown in the FIG., Is continuously obtained in a high concentration argon from air. 특히, 제1단계 PSA 장치에 공지의 시퀀스 및 타임 사이클을 적용한다. In particular, it applies to the sequence and the cycle time of the PSA apparatus known in the Step 1. PSA 장치에 있어서 각 기계적 장치가 제3도에 나타나 있고, 또한 각 PSA 장치 흡착탑의 크기가 다음의 표 3에 나타나 있다. In the PSA system, and that each mechanical device shown in FIG. 3, and also the size of each adsorption column PSA system shown in Table 3 below. 또한 각 포인트에 있어서 압력, 가스 성분 및 유속은 다음의 표 4와 같다. Also, in each point pressure, gas composition and flow rates are shown in the Table 4 below. 주 : 1. ND는 측정되지 않음(Not Determined)의 약자이며 지르코니아식 산소 분석기에 의해서 측정할 수 없는 농도를 의미한다. Note: 1. ND stands for No (Not Determined) not measured and indicates the number of levels not be measured by a zirconia-type oxygen analyzer. 2. 가스 성분의 그외 모든 자료는 가스 크로마토그라파에 의해 얻은 분석치이다. 2. All other data of the gas component is obtained by gas chromatography analysis chiyida Grappa. 상기의 표4에 나타단 바와 같은, 제1단계 PSA 장치의 유출가스(2)내 아르곤은 99% 농도까지 농축되어 제4단계 PSA 장치의 유출구(10)에서 40% 수율로 회수된다. An argon gas outlet (2) of the PSA system, the first stage as shown in the stage shown in Table 4 was concentrated to 99% concentration is recovered from the outlet 10 of the PSA apparatus of the step 4 in 40% yield. 제1단계 PSA 장치의 유출가스(2) 내 90% 농도의 산소는 라인(5)에서 94.8%의 농도까지 농축되어 제2단계 PSA 장치 내에서 150Torr의 압력으로 탈착된다. The gas outlet (2) of oxygen in 90% of stage PSA system 1 is concentrated on the line (5) to a concentration of 94.8% is desorbed at a pressure of 150Torr in a second step 2 the PSA system. 또한 산소가 존재하지 않는 86.6% 농도의 질소 가스는 제5단계 PSA 장치에서 탈착가스(13)로서 수득된다. In addition, nitrogen gas of 86.6% concentration of oxygen is not present is obtained as a desorbed gas (13) in a fifth step the PSA system. O 2 를 주성분으로 하고 최소한 3%의 아르곤을 함유하는 출발가스로부터 압력-스윙-흡착방법에 의하여 아르곤과 산소를 선택적으로 수득하는 방법으로서, 상기 출발가스를 3개의 탄소분자체로 충전된 컬럼을 함유하는 첫번째 흡착기구에 도입하며 ; An O 2 as a main component, and the pressure from the starting gas containing argon at least 3% Swing A method for selectively obtained as the argon and oxygen by adsorption, containing a packed column to the starting gas to a three tansobun itself introduced into the first suction mechanism and; 상기 출발가스를 압력-스윙-흡착조작으로 고순도의 O 2 및 중간농도의 Ar을 수득하고 ; The gas from the pressure-swing-Ar to give a concentration of O 2 and an intermediate of a high purity in the adsorption operation, and; 연속적으로 중간농도의 Ar을 2개의 탄소분자체로 충전된 컬럼을 함유하는 두번째 흡착기구에 도입하며 ; Continuously introduced into the second absorption apparatus comprising a column filled with Ar to the mid-range two tansobun itself and; 상기 중간 농도의 Ar을 압력-스윙-흡착조작으로 수행하고 ; The Ar concentration of the intermediate pressure-swing-adsorption operation carried out and; 두번째 흡착기구에서 탈착된 가스를 첫번째 흡착기구의 입구로 순환시키고 ; Circulating the desorption gas from the second adsorption apparatus to the inlet of the first suction mechanism and; 상기 압력- 스윙-흡착조작의 흡착압력이 0.3 내지 10㎏/㎠G이고 또한 탈착압력이 760Torr를 넘지 않음으로써 압력-스윙-흡착방식에 의해 고농도의 아르곤을 수득함을 특징으로 하는 방법. Characterized in that to obtain a high concentration of the argon by adsorption system, said pressure-swing-adsorption pressure is from 0.3 to 10㎏ / ㎠G of the adsorption operation, and also by pressure desorption pressure is not more than 760Torr-swing. 제1항에 있어서, 두번째 흡착기구에서 얻은 농축 아르곤을 지올라이트 분자체로 충전된 흡착기구에서 압력-스윙-흡착조작을 수행하여 질소를 분리함으로써 고농도의 아르곤을 수득하는 상기 방법. The method of claim 1, wherein the pressure is concentrated in argon obtained from the second absorbing mechanism absorbing mechanism filled with a zeolite molecular sieve, said method for obtaining a high concentration of the argon by separating the nitrogen to perform the suction operation-swing. 제2항에 있어서, 두번째 흡착기구에서 얻은 농축 아르곤을 지올라이트 분자체로 충전된 흡착기구에 보내기 전에 탈소화 기구로 통과시켜 그곳에서 수소를 부가하여 실질적으로 산소가 없는 고농도의 아르곤을 수득하는 상기 방법. The method of claim 2 wherein the concentration of argon obtained from the second suction mechanism zeolite minute was passed through a de-extinguishing before sending to the adsorption mechanism filled with a self above to obtain a substantially high concentration of the argon-free oxygen in addition to hydrogen, where Way. 제3 항에 있어서, 지올라이트 분자체로 충전된 흡착기구에서 탈착된 가스를 지올라이트 분자체로 충전된 두번째 흡착기구에서 압력-스윙-흡착조작을 수행하여 아르곤을 회수하고 또한 수득된 농축 아르곤을 지올라이트 분자체로 충전된 첫번째 흡착기구의 입구에서 출발가스와 혼합하는 상기 방법. The method of claim 3 wherein the zeolite minutes in the second suction mechanism to charge the desorbed gas from the adsorption apparatus filled with itself as zeolite molecular sieve pressure-cost perform adsorption operation to recovery of argon and also obtained concentrated argon-swing Zeolite min the method of mixing the starting gases at the inlet of the first adsorption apparatus filled with itself. 제1항에 있어서, 농축 아르곤을 탈산소화 기구로 통과시켜 그곳에 산소를 부가함으로써 실질적으로 산소가 없는 고농도의 아르곤을 수득하고 또한 이것을 저온 액화장치로 보내 그곳에서 아르곤을 액화하여 질소를 분리함으로써 고순도의 아르곤을 수득하는 상기 방법. According to claim 1, by passing the concentrated argon deoxygenated mechanism by substantially obtain a high concentration of the argon-free oxygen by adding oxygen thereto, and also remove the nitrogen in this liquid argon from there directed to the low temperature liquefaction apparatus of highly pure the method for obtaining argon. 제1항에 있어서, 상기 탄소분자체가 직경 3Å의 미세공을 갖는 방법. 2. The method of claim 1, wherein the tansobun sieve having micropores with a diameter of 3Å. 제1항에 있어서, 흡착압력이 1 내지 3㎏/㎠G인 상기 방법. The method of claim 1, wherein the method of the adsorption pressure of 1 to 3㎏ / ㎠G. 제1항에 있어서, 탈착이 400Torr 또는 그 이하의 압력에서 수행되는 상기 방법. The method of claim 1, wherein the method is carried out at a desorption pressure of 400Torr or less. 제1항에 있어서, 탈착이 200Torr 또는 그 이하의 압력에서 수행되는 상기 방법. The method of claim 1, wherein the method is carried out at a desorption pressure of 200Torr or less.